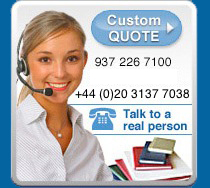 or Click to request a quote. We will be glad to send you a free sample Custom Notebook if your company has more than 100 users of such notebooks (one sample per company). 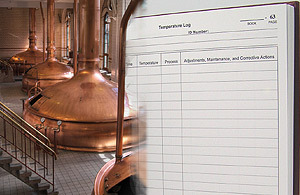 If you want us to make you a highly Customized Log Book, then please contact us about the possibility of getting a free sample. We have combined the speed and flexibility of high tech printing with the quality and reliability of traditional binding methods to bring you highly customized books on demand at incredibly low prices. We specialize in hard backed case bound notebooks constructed by artists practicing the Old World art of bookbinding. Your book will be Section Sewn and printed on 24 lb. acid-free, archival safe paper. All the materials used in the construction of our books are of the highest quality and are selected based on their ability to stand the test of time. BookFactory's revolutionary approach to Custom Notebook production means you get a revolutionary approach to pricing. Because of our processes, you no longer need to order hundreds or thousands of books to get a good price. Great pricing can be had at virtually any quantity. Are you waiting months for your custom books to arrive? We can deliver large quantities of custom books in just weeks after you approve a first article sample of your book. Our books are constructed to the highest quality standards and we stand behind them with our Quality Guarantee. If you find a manufacturing defect we will replace your book free of charge. 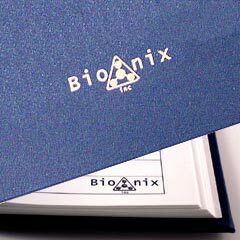 If you are looking for a quote on a large volume of Custom Notebooks please click on the link below or call us.If you're not looking for custom books but are interested in large quantities of one of our standard books just contact us and we will be happy to quote your order.